Compulsory per charter a standard charter pack: payable at base in cash and added to the charter rates. This includes final cleaning, complimentary starter pack, bed sheets & towels (one set per person), first fill for outboard engine, spare bottle of gas. 3 cabins €110, 4 cabins € 160, 5 cabins €180, catermarans €200. The pack includes: 4 bottles of water (1.5 L each), 1 pack of 6 Coke cans, 1 small bottle of washing up liquid, 1 dish cloth/sponge, garbage bags, 1 roll of paper towels, 1 box of matches, 1 roll of toilet paper in each head. Booking on request, depending on availability and seasons. Long term discount 5% on any charter from 13 nights to 20 nights – 10% from 21 nights to 27 nights – 15% from 28 nights or more. Early booking discount 5% for any charter booked and down paid 180 days or more prior departure date. Repeater discount 5% for any repeat client. Our yachts are delivered to you with full tanks of fuel (yacht & dinghy), full tank of water, 1 bottle of cooking gas in duty + 1 spare bottle. You have to re-deliver the yacht with full tanks of fuel and water. Security Deposit To be paid at the base upon embarkation by bank certified cheque, cash, credit card (Visa and MasterCard only) If paid by credit card the client should contact his/her bank previously and let them know about the transaction. Should the refundable full security deposit by credit card be refused at the time of embarkation, client will be obliged to subscribe the non refundable security insurance. Our yachts are very well maintained and undergo regular technical checks. Should a technical failure happen despite our highly professional maintenance, we commit ourselves to repair the failure in the next 4 hours following your call at the base during working hours (8 am to 5 pm). If you lose more than 4 hours (during working hours) we will refund you one full day. If the repair takes more than 1 day, we will provide you with a similar boat or refund you on a pro rata basis. In case of emergency you can rely on our hot line, at any time, 7 days a week. The balance of payment (skipper and/or hostess or spinnakers excepted) should be paid to (again by bank draft) 45 days before charter’s departure. Skipper and/or hostess are payable in cash only upon embarkation. Personal checks of any kind, for any payment, are NOT accepted. Bank drafts, traveller cheques, certified bank cheques / cashier’s cheque, Visa & Master credit cards – ALL acceptable for all payments including Deposit Guarantee. NOTE: No charter may begin unless we have received the full payment in Greece prior to embarkation. 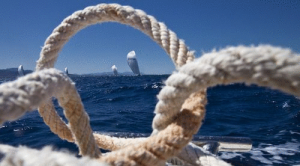 Learn today: do you know the story of sailing?